Everything about the premise of this novel spoke to me and it went to the top of the pile as soon as the ARC showed up in my mailbox. With all the rave reviews out there, I knew I had to bring this book with me on my latest Southeast Asian adventure. 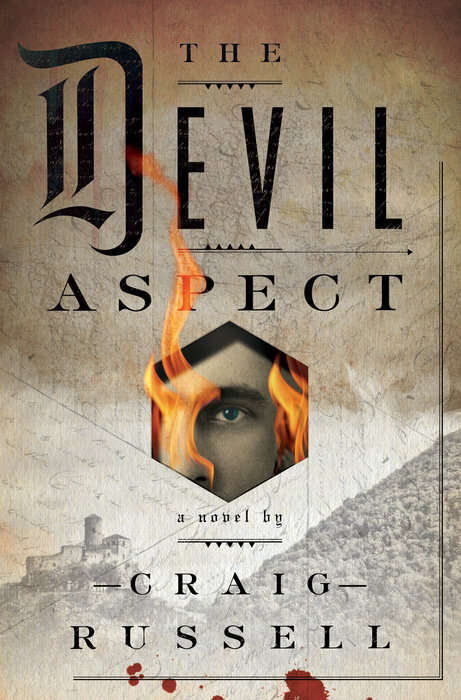 And though Craig Russell is a bestselling and award-winning Scottish author whose works have been translated into twenty-five languages, somehow The Devil Aspect is his American debut. Talk about being late to the party, especially given how good this one turned out to be. Here's to hoping that it will do well commercially on this side of the pond, for I'd love to sample more of Russell's writing in the future. The Devil Aspect is a Gothic horror novel as well as a meticulously researched piece of historical fiction set in Czechoslovakia right before the beginning of World War II. Nazism is on the rise on the other side of the border, threatening to sweep across Europe if Hitler is successful in his folly. Russell came up with a disturbing atmospheric novel steeped into Eastern European folklore, the political history of a relatively young country with an unsteady foundation, and the troubles brewing in Germany. I've never read anything else by the author, so I'm not sure if this is usually his wont. But the man has an uncanny eye for detail and he can set the mood like few of his peers can. The book is dark and oppressive throughout, but a decidedly compelling read nonetheless. The Devil Aspect features two main perspectives, that of Viktor Kosárek, the young psychiatrist, and that of Lukas Smolak, the police investigator. The two storylines remain separate for a while, but they begin to overlap when Smolak seeks out the asylum's expertise to help him on his case. And the more his investigation progresses and the more it appears that Leather Apron and his murders might be linked to the Devil's Six housed in Hrad Orlu, the novel becomes virtually impossible to put down! There are a few pacing issues along the way, but nothing major. It takes longer for Viktor's POV to fully come together, for his storyline is often more about the Devil's Six than his own. Indeed, we follow him as he uses his groundbreaking treatments to search for the Devil Aspect in each of them. So we discover a lot about the six most dangerous murderers in the country, which is quite fascinating, yet we learn little about Viktor himself. There is a second plotline involving him which follows his budding relationship with Judita, a woman also working at the asylum, and which also follows his attempts to track down his wayward friend Filip. Viktor fears that Filip might be involved in the Leather Apron atrocities and he wants to save his friend before it's too late. On the other hand, Lukas Smolak's perspective moves at a very good clip throughout the book, thanks to the never-ending number of new victims butchered by the serial killer. Craig Russell keeps you guessing and the list of possible suspects keeps adding up. The setting is absolutely perfect, with the ethnic tensions plaguing this culturally diverse country tainting every murder as well. Prague and its surroundings also come alive in spectacular fashion, something akin to what Carlos Ruiz Zafon did with Barcelona in The Shadow of the Wind. The endgame and the finale, when they come, will shock and amaze you. The epilogue felt a bit unnecessary, but it does close the show with a certain flair. The Devil Aspect is definitely one of the books to read this year!